REDUX CONTEMPORARY ART CENTER is a nonprofit organization committed to fostering creativity and the cultivation of contemporary art through diverse exhibitions, affordable studio space for visual artists, meaningful education and outreach programs, and a multidisciplinary approach to the dialogue between artists and their audiences. Born and raised in Burlington, NC, Gret Mackintosh’s earliest memories involve drawing and painting animals, which has led to a lifelong career in the art and design world. After initially entering into the College of Design at North Carolina State University as a Graphic Design major, she quickly realized that her heart remained in the fine arts and switched to a double major in Art & Design and Landscape Architecture. After graduation, she moved to Charleston, South Carolina to begin her career as a landscape architect, while continuing to pursue painting as a passion. Gret’s extensive commission work as an animal portrait artist spurred from her obsessive drawing and painting of her own spotted canine muse, Louie. She primarily paints using acrylics, but also delves into mixed mediums such as pencil, markers, gouche, and watercolors. 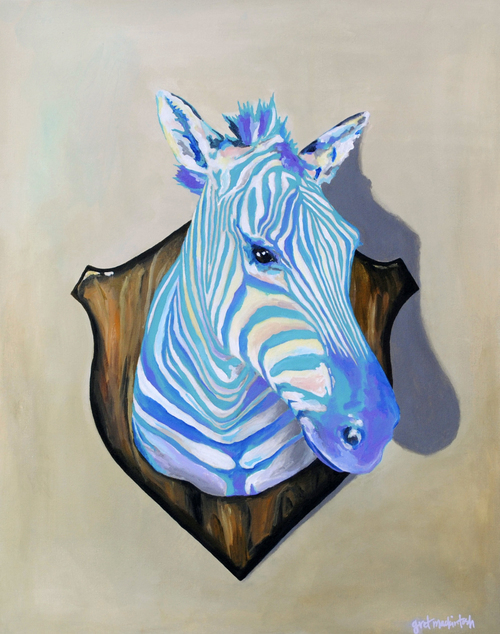 Shee is fascinated by nature, and attempts to balance the dichotomy of realism and abstraction in her paintings by highlighting realistic details through bold color choices such as painting Zebra’s stripes blue. Her constantly evolving view of the natural world guides and inspires her work on a daily basis. Our classes are affordable, fun, challenging and taught by talented local qualified instructors. Courses include painting, photography, drawing, printmaking, art history, and much more. All courses are timed to fit the schedules of working people and are taught by working professional artists. Through our classes, workshops, and studio space we provide the guidance and resources you need to bring your creativity and passion to life. As a Redux member, you will be a valued supporter of one of the region’s most compelling contemporary visual art centers. Individual tax deductible contributions are critical to the continuation of our programming excellence. Member support is needed to present a variety of art education opportunities, exhibitions and site-specific installations, studio facilities to 45 of Charleston’s most talented artists, and many of the daily expenses involved with operating a dynamic nonprofit organization. We achieve so much because we work in collaboration! We benefit from more than 100 volunteers, we love to innovate, and we are supported by people like you. Your tax-deductible gift to Redux’s nonprofit programs will be wisely invested to make an imprint on our region. Thank you for your consideration of this request and for your continued interest in advancing our community’s creative voice. Redux Contemporary Art Center is closed on all major holidays.